The Initiative's Research Grants Program has funded more than $5 million of high-quality research around the world, all to fight a disease that knows no borders. August 1, 2017 - The Liddy Shriver Sarcoma Initiative is pleased to announce the funding of a $500,000 International Collaborative Grant focusing on synovial sarcoma. Synovial sarcoma is a rare cancer that affects the joints. Only 1 to 3 individuals out of one million people will be diagnosed with the disease, but it is the most common soft-tissue sarcoma among adolescents and young adults. Unfortunately, no curative drug therapies exist for the aggressive malignancy. Three investigators from Canada, Sweden and the United States will join forces in this two-year research project. The investigators – Torsten Nielsen, MD, PhD; Bertha Brodin, PhD; and Kevin Jones, MD – have already developed new genomic and epigenomic technologies to investigate synovial sarcoma, as well as definitive cell line and mouse models of this disease. They will use these tools to address the regulation of p53 function in synovial sarcoma, then study therapeutic interventions with the potential to reverse these effects, especially in localized disease. Dr. Nielsen, the study's coordinating investigator, said, "From a scientific and medical perspective, synovial sarcoma is a frustrating disease -- we have figured out the mutation that is the ultimate cause of this cancer, but we have not yet been able to turn this knowledge into an effective targeted treatment. We do know this mutation has to work through known cell control pathways, and we believe this may make it vulnerable to variations on already-available treatment strategies that have not necessarily been tried yet." How is p53 inactivated in primary synovial sarcoma? Does this process vulnerabilities that can be exploited for therapy? Are different mechanisms of p53 loss responsible for advanced/metastatic synovial sarcoma, and does this mean a fundamentally different treatment approach will be needed? Dr. Brodin noted that, "Despite advances in understanding the drivers that lead to synovial sarcoma development and progression, no rational treatments have been developed for affected patients. We will explore the possibility of targeting the p53 axis using available and newly discovered drugs in relevant models of synovial sarcoma to identify potential new treatments. It is a challenge with no guaranty of clinical success, but the work must be done. We hope our research will contribute to increasing patients' survival rate and quality of life." Torsten O. Nielsen, MD, PhD, FRCPC is a clinician-scientist musculoskeletal pathologist (with 75% protected research time) and a Professor of Pathology at the University of British Columbia in Vancouver, Canada. Bertha Brodin, PhD is an Associate Professor in the Department of Oncology-Pathology at the Karolinska Institutet in Stockholm, Sweden, and a Senior Researcher / Principal Investigator of a research group at Cancer Centrum Karolinska. Kevin B. Jones, MD is an orthopedic oncology surgeon-scientist (with 80% protected research time), and an Associate Professor at the University of Utah in Salt Lake City in the United States. This International Collaborative Grant is funded with a grant of $250,000 from the Liddy Shriver Sarcoma Initiative and $250,000 from the investigators. Thus, $500,000 will be directed toward study of these cancers that impact individuals whose most productive years of life lie ahead. Copyright © 2017 Liddy Shriver Sarcoma Initiative. 1) How is p53 inactivated in primary synovial sarcoma? 2) Does this create vulnerabilities that can be exploited for therapy? 3) Are different mechanisms of p53 loss responsible for advanced/metastatic synovial sarcoma, and does this mean a fundamentally different treatment approach will be needed? The international team of investigators brings expertise in p53 and SS18-SSX molecular oncology, pathology, experimental therapeutics and clinical trials, surgery and conditional mouse model technology. All projects are being worked on collaboratively in Salt Lake City, Stockholm and Vancouver. If successful, our investigations will resolve some of the important remaining unknowns about synovial sarcoma biology and guide when best to use existing chemotherapy versus when it is better to use newer agents with different mechanisms matched to the underlying molecular biology of synovial sarcoma. Results may also have wider implications for treatment strategies in cancers that start out in a genetically stable form driven by single events. Synovial sarcoma (SS) is a deadly soft-tissue malignancy for which no curative drug therapies currently exist. It is the most common soft-tissue sarcoma in adolescents and young adults, individuals with their most productive years of life still ahead. At the time of diagnosis, synovial sarcoma usually has a simpler genome than most other cancers, making it important for the study of fundamental mechanisms of cancer progression. Synovial sarcoma is initiated by a t(X;18) balanced chromosomal translocation that generates a fusion gene between SS18, a member of the SWI/SNF chromatin remodeling complex, and one of the fusion partners SSX1, SSX2, or SSX4.1,2 SWI/SNF complexes are recruited to chromatin by transcription factors, where they serve to shift the position of nucleosomes. In this manner, the DNA is made accessible for gene transcription. Current models propose that synovial sarcoma develops due to disruptions in SWI/SNF activity, owing to incorporation of the fusion gene in native SWI/SNF complexes, and concurrent activation of Polycomb pathways that oppose SWI/SNF function. TP53, encoding the p53 protein known as "the guardian of the genome," is the most frequently mutated gene in cancer. Loss of p53 function simultaneously confers multiple oncogenic characteristics, including: loss of cell cycle checkpoint controls, growth under low oxygen and nutrient-deprived conditions, blocks to apoptosis, tolerance of mutations and chromosomal instability (facilitating tumor evolution to incurable forms), and resistance to both chemotherapy and radiotherapy. Advanced, metastatic and untreatable cancers of all types have in most cases lost p53 function, through mutation/deletion of both gene copies, or through mutations that lead to accumulation of a dominant negative, nonfunctional p53 protein. Synovial sarcoma is one of a select group of cancers (including pediatric and translocation-associated sarcomas) characterized by two copies of intact, wildtype p53 genes – at least in primary tumors at the time of initial diagnosis. As loss of p53 function is considered a hallmark of cancer, this raises the question of how p53 is suppressed in synovial sarcoma, whether p53 activity can be restored by therapeutic intervention, and if different mechanisms of p53 loss come into play in advanced disease (e.g. requiring different therapy). Attempts to address some of these questions were made over a decade ago using older technologies, but the availability of new genomic methods and experimental models, and new data highlighting connections between SS18-SSX and p53 signaling, now allows much more capacity to understand the biological and clinical implications of the p53 pathway in synovial sarcoma. Bertha Brodin, PhD is an Associate Professor in the Department of Oncology-Pathology at the Karolinska Institutet in Stockholm, Sweden, and a Senior Researcher / principal investigator of a research group at Cancer Centrum Karolinska. She has published over a dozen primary research articles on synovial sarcoma, including pioneering work on the role of p53 in this disease. 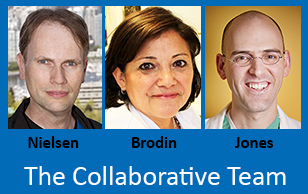 Dr. Brodin has been an active collaborator in the sarcoma community worldwide, sharing cell lines and vector constructs with others on request. Recently, Dr. Brodin began an active collaboration with Dr. Nielsen’s laboratory, developing new technologies to interrogate the synovial sarcoma complex and identify how it can be disrupted by targeted drug treatments. Kevin B. Jones MD is an orthopaedic oncology surgeon-scientist (with 80% protected research time), and an Associate Professor at the University of Utah in Salt Lake City. Based at the Huntsman Cancer Institute, Dr. Jones’ research into sarcoma mouse models was initially mentored by Nobel Laureate Mario Capecchi, with Dr. Jones establishing his independent laboratory in 2013. He has published over 40 peer-reviewed sarcoma research articles, among which have been recent studies he led concerning the role of beta-catenin in synovial sarcoma and the development of the world’s first SS18-SSX1 mouse model. Dr. Jones previously collaborated with Dr. Nielsen in highly successful studies that connected the function of the SS18-SSX oncoprotein to abnormal gene repression and to anti-apoptotic pathways. Dr. Jones is also the author of What Doctors Cannot Tell You, a book about how patients and physicians can communicate effectively in the face of uncertainty, and has given at TED talk on why curiosity is the key to science and medicine. Torsten O. Nielsen, MD, PhD, FRCPC is a clinician-scientist musculoskeletal pathologist (with 75% protected research time), and a Professor of Pathology at the University of British Columbia in Vancouver, Canada. He is also the co-chair of the Canadian Cancer Trials Group sarcoma committee. For the past 11 years, he has held grants for the study of synovial sarcoma, including a prestigious Impact Grant from the Canadian Cancer Society. His team currently includes two graduate students, one technologist and one research associate specifically devoted to the study of synovial sarcoma, within a larger sarcoma and breast cancer translational research group he directs. Dr. Nielsen has a track record of over 20 publications relating to the biology, diagnosis, and treatment of synovial sarcoma, including the collaborative studies mentioned above, as well as participation in a previous International Collaborative Grant with colleagues at Memorial Sloan Kettering and from the Netherlands that led to discoveries about how the SS18-SSX protein complex works. The MDM2 oncoprotein is the key negative regulator of p53. MDM2 is highly expressed in many p53 wildtype tumors, but fewer than 40% of synovial sarcomas show evidence for MDM2 copy number gains.4,5 This means that other pathways that downregulate p53 directly or via MDM2 activation are likely involved. The Nielsen group showed that the CDKN2A locus (encoding both the cell cycle checkpoint p16INK4a and the MDM2 regulator p14ARF) is epigenetically and transcriptionally silenced by the SS18-SSX oncoprotein.6 The resultant functional absence of p14ARF can lead to TP53 degradation via unchecked MDM2-mediated ubiquitination. Data from the Brodin group has shown that SS18-SSX transfected sarcoma cells accumulate MDM2 and ubiquitinated p53.7 The Jones group performed a shRNA library screen in vivo and found MDM2 to be necessary for tumor cell survival. Thus, multiple lines of evidence indicate that hyperactivity of MDM2 may be critical to this tumor's ability to bypass the TP53 checkpoint. One related pathway of established importance to SS oncogenesis is PI3K/AKT signaling. Phosphorylation of the serine residues at positions 166 and 186 in MDM2 by pAKT, the key effector of PI3K, is required for moving MDM2 into the nucleus where its ubiquitinating function tags p53 for degradation.8 PI3K signaling has been found to be strongly upregulated in many SS tumors,9,10 and the increased presence of pAKT has been associated with a worse prognosis and metastasis in SS patients.11 Recently, the Jones group found that TP53 protein levels are diminished in Pten-disrupted mouse SS tumors. Phosphorylated MDM2 is elevated, but not MDM2 itself, suggesting increased PI3K signaling may be the driver. The role that this plays in the observed metastatic phenotype remains to be tested. Using human cell lines, human tumors, and mouse genetic models of synovial sarcoma shared via this international collaboration, we propose to investigate the mechanisms by which the SS18-SSX oncoprotein and its key associated pathways are linked to these and related pathways that converge on TP53 function, setting up subsequent aims that look to exploit this therapeutically and assess the role of impaired TP53 function on disease progression. SS18-p53 interactions and cell stress: Initial work will use a panel of six synovial sarcoma cell lines, for which we have characterized mutational status using the IMPACT gene panel from Memorial Sloan Kettering, as shown in Figure 1. These cell lines maintain wildtype p53 status – except for the Yamato-SS cell line, which carries a number of additional genetic lesions. 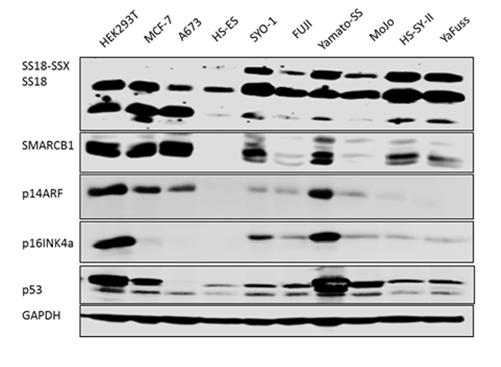 Western blots show the levels of p16INK4a, p14ARF, and p53 are generally low in the SS cell lines, again with the exception of Yamato-SS cells, which show a characteristic accumulation of the mutant (inactive) p53 protein. Preliminary results from the Brodin group suggest that native SS18 serves as a transcriptional activator, interacting with p53 during cell stress responses. We postulate that in synovial sarcoma, SS18-SSX similarly interacts with p53, but this interaction may interfere with transcriptional induction of p53 target genes, blocking growth-suppressive and pro-apoptotic functions. Under conditions of genotoxic stress, we will apply methods published by Nielsen/Jones6,12 to assess SS18-SSX, ATF2, TLE1 and H3K27Me promoter residency, epigenetic and transcriptional status of key p53 effectors in synovial sarcoma cells with and without SS18-SSX knockdown, in comparison to normal cells (which express SS18 but not SS18-SSX). This will also include a comparison between SS18-p53 interactions (as assessed by co-immunoprecipitation and proximity ligation assay) induced by cytotoxic stress in (1) SYO-1 (TP53 wildtype) vs Yamato (TP53 mutant) synovial sarcoma cells and (2) in xenografts from patients bearing wildtype vs. p53 mutant tumors. MDM2 gene copy number, protein expression and posttranslational modification status: We hypothesize that, for most SS cases, MDM2 suppresses p53 not via MDM2 DNA amplification, but rather via upstream changes leading to higher protein activity. First, we will confirm detectable MDM2 protein expression by immunohistochemistry on our new tissue microarray series, in comparison to tumors with known amplification of the MDM2 gene. Then, using the Vancouver SS cell lines, Karolinska primary cells, and Utah mouse model cells, we will assess the protein expression of MDM2, its target p53 and its upstream regulator p14ARF by Western blot, including with antibodies and gel conditions that allow resolution of ubiquitinated (p53), sumoylated and phosphorylated (MDM2) forms. Tumors from mouse model systems will be evaluated as part of validation studies, and may also be used to evaluate selected drug candidates that interfere with implicated posttranslational modification pathways, to see if they can reverse key oncogenic mechanisms in SS. Epigenetic and functional status of the SS18-SSX-targeted p53 regulatory gene, CDKN2A: Mechanistic studies from the Nielsen & Jones labs have confirmed that SS18-SSX is targeted to chromatin by the transcription factor ATF2, resulting in repression of a number of stress response and tumor suppressor genes including the important tumor suppressor, CDKN2A. SS18-SSX serves as a bridge between ATF2, which binds the CDKN2A promoter, and the transcriptional corepressor TLE1 which interacts with repressive histone deacetylase and polycomb complexes. Recently-released TCGA data supports our finding that CDKN2A is uniquely low in synovial sarcoma in comparison to other sarcomas (Table 1). By comparison, TP53 is high, whilst MDM2 and PTEN levels are not significantly different from what is seen in other sarcomas. The Cancer Genome Atlas (TCGA) began in 2005 as a project to catalogue all genetic mutations responsible for cancer, using genome sequencing and bioinformatics techniques. TCGA applies high-throughput genome analysis techniques to improve our ability to diagnose, treat, and prevent cancer through a better understanding of the genetic basis of this disease. Data is publicly available to all researchers. The CDKN2A gene encodes two distinct proteins, p16INK4a, and p14ARF. p16INK4a inhibits cyclin dependent kinases, inducing cell cycle arrest. p14ARF is translated from an alternate reading frame of the CDKN2A transcript, and is structurally unrelated to p16INK4a. p14ARF has a well described tumor suppressive role, binding to MDM2, promoting its sumoylation and thereby preventing ubiquitination and degradation of p53. Given that CDKN2A (1) appears to be a direct target of the SS18-SSX oncoprotein, (2) its repression has been validated by others, and (3) it regulates both cell growth and p53 function, we believe this may be the most important effector of SS18-SSX oncogenesis. In the absence of drugs directly targeting SS18-SSX, restoration of the CDKN2A/MDM2/p53 axis may be key to developing improved, rational, targeted treatments for this disease. In these studies, we will focus more intensively on the regulation of the p14ARF transcript in human cells and mouse tissues, and will attempt to confirm cell line data involving the proposed ATF2/SS18-SSX/TLE1 mechanism. CpG methylation status, and binding of alternate repressors and corepressors will be investigated by ChIP-qPCR in vivo in mouse and in primary cultures. Work in progress in Vancouver and Utah exploits recent optimization of chromatin immunoprecipitation and next generation sequencing methods (ChIP Seq) for application to small volumes of human biopsy tissue. These methods use highly avid antibodies to epigenetic marks and have been used to determine genome wide nucleosomal modifications including H3K27me3 (polycomb), H3K4me3 (trithorax), H3K36me3 (transcriptional activation), H3K4me1 and H3K27ac (enhancer), and H3K9me3 (heterochromatin). ChIP-Seq and bisulfite CpG methylation analysis of human and mouse tumors will validate this repressed epigenetic status of CDKN2A, as shown in preliminary genomic data generated by the Nielsen lab from a pilot study of five synovial sarcomas (Figure 2). 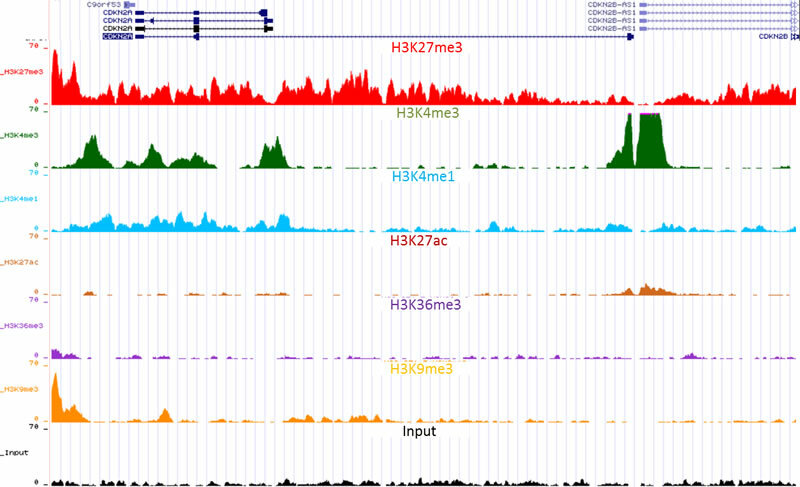 In the figure, the polycomb mark (H3K27me3) is shown to have been deposited across the entire locus, including the antisense transcript which shows little evidence of activated transcription (H3K36me3). This preliminary data provides support for an aberrant mechanism of repression at this locus, and will be investigated further in expanded cohorts and in comparison to treatment manipulations of synovial sarcoma mouse models. Chromatin Immunoprecipitation (ChIP) is a molecular biology method used to map DNA sites of specific protein-DNA interactions. This can be measured by qPCR, quantitative polymerase chain reaction, a method used to measure the amount of DNA in given sample. ChIP-sequencing is a method used to analyze protein interactions with DNA. ChIP-seq combines chromatin immunoprecipitation (ChIP) with massively parallel DNA sequencing to identify the binding sites of DNA-associated proteins. It can be used to map binding sites precisely across the entire genome, for DNA-interacting proteins of interest. Figure 2. Epigenetic status of CDKN2 in synovial sarcoma. Association of CDKN2 and other genomic targets with SS18-SSX. At present there are no available ChIP-grade antibodies to SSX proteins. The presence of abundant wildtype SS18 protein complicates the use of antibodies to SS18 for ChIP; thus we will evaluate double pulldowns of SS18 with SSX-interacting proteins TLE1, BCOR, and polycomb components which are not known to interact with wildtype SWI-SNF complexes. Through our ongoing collaboration with Scott Lowe at MSKCC, we will evaluate (both at the CDKN2A locus and genome wide) a hemagglutinin (HA)-tagged version of the endogenous SS18-SSX2 gene in HS-SY-II synovial sarcoma cells, constructed using CRISPR/Cas9 gene editing technologies. This work will provide the most definitive localization of the fusion oncoprotein to chromatin, a critical element of further theoretical and experimental work. Our prior work established a mechanistic basis for the promising anti-cancer activity of HDAC inhibitors in human synovial sarcoma. In brief, we showed that HDAC inhibitors disrupt the repressive complex between ATF2, TLE1 and HDAC1, leading to reactivation of ATF2 target genes including CDKN2A. Given the validation of low CDKN2A expression in primary human tumor specimens (Table 1), its reversibility in more clinically-advanced models and the effect this has on MDM2 and p53 is certainly worth analyzing. We will treat primary cultures(from Karolinska, described below in Project 2) and the most readily assessable drug testing mouse model generated in Utah (SS18-SSX2;Ptenfl/fl TATCre induced) for reversion of epigenetic modifications at the CDKN2A locus, as well as MDM2 and p53 protein levels and posttranslational modification status. mRNA isolated from quisinostat-treated mouse tumors will be measured using RNA-Seq, with expression changes correlated with untreated tumors and with orthologous RNA seq measurements from cell lines. Impact: In the proposed studies, we will build on the knowledge base from expression profiles and proteomic analyses of human synovial sarcomas, and the most critical oncogenic pathways in SS, to identify the fundamental biology needed to evaluate drug treatments in model systems. These measurements will be critical to evaluate mechanisms of drug resistance and to identify rational drug combinations, as well as to provide biomarkers that can assess if drug treatments applied to mouse models and in clinical trials are indeed targeting the fundamental biology of synovial sarcoma oncogenesis. Background and Preliminary Data: Silencing of the p53 checkpoint can enable cancer cells to by-pass apoptotic responses to the accrual of DNA damage. Synovial sarcoma has long been considered to be more “responsive” than many other soft-tissue sarcomas to chemotherapy regimens including doxorubicin and ifosfamide,13 albeit with little consequent survival benefit. Although there is some controversy about the precise anti-cancer mechanisms of doxorubicin, most proposed mechanisms include an element of DNA-damage. Ifosfamide, an alkylating agent, is very clearly a DNA-damaging therapy. It may be that SS is more responsive to these therapies because the silencing of the p53 checkpoint is less rigid in SS than in other soft-tissue sarcomas. Because most SS tumors have not lost TP53 genetically by copy number or mutation, they may retain the capacity to reinvigorate that checkpoint in the circumstance of severe treatment-induced DNA-damage. The major approach to restore wildtype p53 activity in tumors has been to inhibit the function of p53’s negative regulator MDM2. This has led to several preclinical and clinical trials focused around small molecules that block the N-terminal protein-protein interaction between p53 and MDM2 such as Nutlin3a, RG7112, and RG7388/Idasanulin. In preclinical studies, the group of B. Brodin has previously demonstrated that the SS18-SSX fusion oncoprotein promotes the ubiquitination and degradation of TP53 by stabilizing MDM2.7 They also showed that, by blocking the interaction of MDM2 and p53 with Nutlin-3a, the p53 response to genotoxic stress is restored in synovial sarcomas.14 As mentioned under project 1, pAKT phosphorylates and stabilizes MDM2 activity contributing to the dysregulation of TP53 tumor suppressor function in synovial sarcoma. Furthermore, drug screens performed independently by the Nielsen (presented at CTOS 2015) and Brodin (Figure 3) groups identify PI3K inhibitors among the most common “hits” blocking growth of synovial sarcoma cells. We therefore hypothesize that combinations of 1) MDM2 inhibitors with genotoxic agents, and/or 2) MDM2 and PI3K/AKT inhibitors will have a synergistic anti-tumor effects in synovial sarcomas with intact p53, and provide a rational therapeutic route to treat these tumors. Establishment of patient-derived synovial sarcoma primary cultures: Synovial sarcoma biopsies and matched normal muscle tissue (controls) are being procured from patients undergoing surgery at the Karolinska University Hospital. Tumor and normal tissue samples are dissociated enzymatically from the biopsies, cultured in vitro and expanded for drug activity studies and genomic profiling (RNA-seq, gene mutation and copy number analysis). The primary cultures are characterized to confirm the presence and percentage of synovial sarcoma cells, by determining the expression of the SS18-SSX fusion protein in situ using proximity ligation assay techniques and RT-PCR (Figure 4). Such primary synovial sarcoma cells will carry even fewer secondary mutations than the established cell lines. Ex-vivo drug screening of patient-derived synovial sarcoma cells: To investigate the activity of a library of available cancer drugs in patient-derived sarcomas, the Brodin lab has implemented a phenotypic screening assay developed by colleagues at the Institute for Molecular Medicine Finland, termed the Drug Sensitivity and Resistance Test. In brief, in this system, patient-derived sarcoma cells are exposed to a library of 528 cancer drugs at five different concentrations. The data is analyzed using a quantitative scoring approach that identifies selective drug response patterns between patient tumor cells and control patient matched mesenchymal cells. Initial results using this assay identified mTOR/PI3K/Akt inhibitors as top hits (Figure 3, above), as well as second generation MDM2 antagonists such as RG7388/Idasanutlin. This library is constantly updated and contains a comprehensive panel of anti-cancer drug classes and agents, of which 40% are FDA approved and the rest are in clinical trials. Novel p53 reactivators / MDM2 antagonists available through collaborations with David Lane and Sonia Lain (now at Karolinska) will also be tested as they become available. Top hits will be added to the planned experiments described below for DNA alkylators and Akt inhibitors, if they are clinically approved agents not previously tried in synovial sarcoma. Activity of MDM2 antagonists in combination with DNA alkylating drugs: Patient-derived synovial sarcoma cells and synovial sarcoma cell lines carrying intact copies of TP53 will be used to test the activity of the MDM2 antagonist RG7388/Idasanutlin in combination with the established anti-sarcoma drugs. To confirm the postulated mechanism of action, we will assess the phosphorylation of MDM2 and ubiquitination of p53 following drug treatment, with synergism formally assessed by the Chou-Talalay method. Activity of MDM2 antagonists in combination with AKT inhibitors: As described in project 1, pharmacological inhibition of the PI3K/Akt pathway in combination with MDM2 inhibitors may synergistically reconstitute p53 response and restore tumor suppressive effects on SS. We will therefore assess the activity of the MDM2 inhibitor idasanutlin in combination with PI3K/Akt inhibitory drugs (Figure 3, above) in patient derived synovial sarcoma cells and cell lines. In experiments spanning projects 1 and 2, the role of the PI3K pathway in these cells will be confirmed by assessing if siRNA or CRISPR/Cas9 knock-down phenocopies the effects on growth, MDM2 phosphorylation and p53 ubiquitination status in these models. Combination of MDM2 antagonists with HDAC inhibitors: Previous work from our groups and from others has shown that HDAC inhibitors are active against synovial sarcoma models, as was investigated by proximity ligation assay in a recently published collaborative study from the Brodin and Nielsen labs.15 Project 1 includes experiments seeking to confirm data showing they restore CDKN2A activity. As this might lead to sumoylation of MDM2, synergism with idasanutlin might also be possible and will be assessed by the Chou-Talalay method. Potency will be directly compared to the synergy we have already observed when combining HDAC and proteasome inhibitors,15 under consideration for advancement to clinical trial. Synergy of existing drugs with agents targeting MDM2 may have important ramifications for dose reduction, given toxicities associated with MDM2 inhibitors. Results from these experiments will guide the testing of the best two or three combination regimens in the in vivo models of genetically induced synovial sarcoma. The group has already published pre-clinical testing of drug regimens in the genetically engineered models.12 The models really provide an optimal platform for validation of drugs as the tumors that arise in the mice share similar variation (in response and resistance) to that seen across the population of human synovial sarcomas. Thus, the experiments in the mice offer the opportunity for biochemistry and proximity ligation assays from treated tissues to confirm pharmacodynamic biomarkers of response and resistance. Final confirmatory experiments will also be undertaken using at least one of our available PDX models. This multi-faceted translational approach will provide a direct route to a prioritize regimens for a human clinical trial. Nielsen, in his role as chair of the Canadian Cancer Trials Group, would bring the lead combination to the CCTG Investigational New Drug committee for clinical trial design, as was previously done successfully for a trial of HDAC inhibitor SB939 in translocation-associated sarcomas.16 In collaboration with Brodin, we would also present the concept to the Scandinavian Sarcoma Group to increase potential accrual. Background and Preliminary Data: Exome sequencing of human SS tumors has confirmed the presence of contributing secondary mutations in only rare cases,17,18 and results shown in Figure 1 found no consistent secondary mutations across available human SS cell line models, contrary to other human cancer cell lines. This fits published data suggesting that translocation-associated sarcomas are, overall, very simple genetic malignancies. Copy number analyses have also identified low levels of variation overall, but have suggested that increased variation associates with poor prognosis.19-21 A significant gap in knowledge surrounds the source of this genomic instability by copy number variation. Because such copy number variation in most tumor types can only follow disruption of p53 genomic surveillance function, we hypothesize that the biological result of lost p53 function (herein modeled by genetic silencing) will be an increase in copy number variation in tumors stressed by genotoxic treatments. The association between increased copy number variation, measures of genomic complexity and poor outcome exposes a fundamental association between increased copy number variation and ultimate chemotherapeutic resistance. However, increased genomic complexity does not associate with any change in response to chemotherapy, suggesting that it drives the development of potentially resistant subclones more than upfront resistance.19 The most common chemotherapy currently given for SS uses doxorubicin and ifosfamide. While SS tumors respond with tumor shrinkage to a greater extent than many other soft-tissue sarcomas,13 the survival benefit of these agents as adjuvant systemic treatments is modest. Once a patient has clinically detectable metastasis, ultimate cure rates are very low. Importantly, some cases of SS are managed successfully using local control measures only, suggesting that aggressive systemic therapies and their inherent risks are not necessary for these patients. Controversy exists over the value of adjuvant chemotherapy for SS, with wide disparities in its use: routine at some sarcoma centres (particularly pediatric and US-based centres) but almost never used at others (chemotherapy is reserved for metastatic cases only at e.g. the British Columbia Cancer Agency and at Karolinska). A major theoretical concern is that DNA-toxic therapies may actually accelerate the development of genomic instability (or the selected growth of genomically unstable subclones), contributing to progressive, poor prognosis SS. The standard treatments applied to synovial sarcomas are known to be genotoxic, raising the concern that they may engender the genomic instability that characterizes disease relapses which are so devastatingly recalcitrant to additional treatments. Two histologic features that define SS make progression distinct from the type degeneration into a de-differentiated tumor seen in many other types of sarcoma. First, SS tumor cell nuclei do not demonstrate atypia and pleomorphism, which would be readily detectable should secondary genetic changes drive significant degeneration. Second, SS tumors often demonstrate an unusual, “biphasic” tissue morphology that includes epithelial gland formation in the midst of otherwise mesenchymal tissue, but metastasis does not require loss of epithelial differentiation in human or mouse SS tumors. These two unique morphologic characteristics of SS make it an innovative and highly instructive model cancer for the study of specific pathway manipulations due to the ability to parse pathway impacts as distinct from mere degeneration and instability. Figure 5: Localized mouse model of synovial sarcomagenesis in the mouse. These innovative features of SS as a model cancer are enhanced by the elegantly simple mouse models generated by the Utah group, driven by expression of a fusion oncogene alone in a mouse with an intact immune system3,22 (Figure 5). The lack of required secondary mutations for spontaneous oncogenesis in these models simplifies interpretation of the impact of any gene manipulations, such as introduction of Pten deletions to enhance PI3K signaling, or genetic silencing of Trp53 to model the effects of its receiving more fixed epigenetic silencing or protein instability. Such secondary manipulation in preliminary experiments of PI3K signaling led rapidly to spontaneous metastasis and limiting morbidity in a localized induction model of primary tumorigenesis (Figure 4, panel C). Tightly linked to the careful experimental approaches in the genetic mouse models, all findings can be validated by correlation with large, independent cohorts of human SS patients available through this collaboration. This will innovatively enable correlation with outcomes for each parameter evaluated, which is critical given the unmet medical need for a means to identify high- and lower-risk SS prior to treatment. Human cell lines of SS will be manipulated by CRISPR/Cas9 technology to genetically silence TP53. TP53-CRISPR and TP53-wildtype cells will be compared with regard to resistance to radiation, doxorubicin, and activated ifosfamide. Western blots will determine the stability/presence of p53 in cell lysates after treatment to demonstrate whether or not non-genetically-silenced p53 reactivates after genotoxic stress. Further, viable (resistant) cells of each TP53 genotype from the cell lines after treatment with either IC50 concentrations of isophosphoramide mustard or control will be evaluated by NanoString nCounter copy number analysis to determine if application of the genotoxic treatment leads to increased copy number variation, especially in the setting of TP53 genetic loss. In order to evaluate the impact of TP53 genetic loss on forward-going synovial sarcomagenesis and the accrual of copy number instability during genotoxic treatments in vivo, we will use the genetic mouse model. Genetic disruption of Trp53 (mouse homologue to human TP53) will be effected using the Trp53-floxed mouse strain procured from Jackson labs. Littermate comparison cohorts of mice that all have either hSS1 or hSS2 and homozygous wildtype, heterozygous, or homozygous floxed Trp53 will be injected with TATCre to induce tumorigenesis. Cohorts of 60 mice (distributed in Mendelian ratios of 1:2:1 by these genotypes) will render 80% power to detect a 3 month shift in the latency to tumorigenesis at the 95% confidence level. Particular scrutiny will be paid to the prevalence of biphasic tumor histology, necrosis, proliferation index, nuclear pleomorphism and lung metastasis. Genetic groups will be compared for each of these parameters by t-tests for continuous variables and Fisher exact tests for categorical variables to measure the impact of homozygous loss of Trp53. In a second cohort of mice, tumors in littermates of the Trp53 homozygous wildtype and Trp53 homozygous floxed genotypes will be treated by weekly doses of ifosfamide. Tumors of each genotype will be sized by thrice weekly serial limb caliper measurements. Ifosfamide and control treatment tumors will be compared after being allowed to grow for 1 week after the last treatment. Comparisons will include histology for pleomorphism, Ki-67 proliferative indices, and necrosis. Five tumors from each genetic group will also be profiled by Agilent array comparative genomic hybridization (aCGH) against germline DNA for copy number variation in controls versus treated mice. As a proof of concept regarding the effects of treatment in human synovial sarcomas, we will treat at least two of our patient derived xenograft models with ifosfamide or control after growing to a size of 100 mm3, then compare five tumors from each group by NanoString nCounter copy number analysis. For validation in a human cohort of patients, we will also perform an analysis of copy number variation in FFPE tumor samples from matched pre-treatment biopsy and post-ifosfamide relapses (local or systemic in location) and from post radiation local relapses of synovial. Although assessments of copy number variation have demonstrated higher levels in relapsed and metastatic tumors previously, these have not specifically been correlated with pre- or post-treatment status of sample procurement. The unmet medical needs that can be addressed through SS research can potentially extend far beyond those individuals with this specific type of sarcoma. SS is an idealized model cancer for the study of the biology of solid tumor oncogenesis and progression, due to its well-developed mouse models and its overall genetic simplicity as a background for experimental manipulations. A clear understanding of the role that loss of TP53 function (likely epigenetic in character, but modeled here by genetic experiments) may play in the ultimate resistance of SS to accepted therapies, as well as an evaluation of the impact of those therapies directly on the genetic stability of SSs can guide therapeutic decisions in the field. The preponderance of clinical evidence suggests that early, primary synovial sarcomagenesis is driven almost exclusively by epigenetic changes and that progressive, deadly synovial sarcomas have somehow accrued increased genomic complexity. Understanding the mechanism of this progression is critical not only to identification of early synovial sarcomas at risk for this ominous progression, but also to enable therapeutic development that targets the dangerous biology in progressive cases. The collaborative experiments outlined above will test not only mechanistic, but also therapeutic hypotheses in an unprecedentedly broad range of models across the three laboratories. Traditional cell line work will be complemented with patient-derived cell culture methods as well as in vivo genetically induced synovial sarcoma models in the mouse. Immediately translatable ideas that will be confirmed or refuted in these experiments include the potential replacement of current genotoxic therapy regimens that may be trading off ultimate survival in their pursuit of what is only short term tumor size reduction. We will also evaluate multiple combination regimens across the full range of pre-clinical validation platforms, very likely yielding at least one prioritized regimen to prioritize for a clinical trial in synovial sarcoma patients. 1. Crew, A.J., et al., Fusion of SYT to two genes, SSX1 and SSX2, encoding proteins with homology to the Kruppel-associated box in human synovial sarcoma. EMBO J, 1995. 14(10): p. 2333-40. 2. Mikami, T., et al., Detection of Rare Variant of SS18-SSX1 Fusion Gene and Mutations of Important Cancer-Related Genes in Synovial Sarcoma of the Lip: Gene Analyses of a Case and Literature Review. J Oral Maxillofac Surg, 2015. 73(8): p. 1505-15. 3. Jones, K.B., et al., The impact of chromosomal translocation locus and fusion oncogene coding sequence in synovial sarcomagenesis. Oncogene, 2016. 4. Nakagawa, Y., et al., Chromosomal and genetic imbalances in synovial sarcoma detected by conventional and microarray comparative genomic hybridization. J Cancer Res Clin Oncol, 2006. 132(7): p. 444-50. 5. Oda, Y., et al., Molecular abnormalities of p53, MDM2, and H-ras in synovial sarcoma. Mod Pathol, 2000. 13(9): p. 994-1004. 6. Su, L., et al., Deconstruction of the SS18-SSX fusion oncoprotein complex: insights into disease etiology and therapeutics. Cancer Cell, 2012. 21(3): p. 333-47. 7. D'Arcy, P., et al., The oncoprotein SS18-SSX1 promotes p53 ubiquitination and degradation by enhancing HDM2 stability. Mol Cancer Res, 2008. 6(1): p. 127-38. 8. Meek, D.W., Regulation of the p53 response and its relationship to cancer. Biochem J, 2015. 469(3): p. 325-46. 9. Bozzi, F., et al., Molecular characterization of synovial sarcoma in children and adolescents: evidence of akt activation. Transl Oncol, 2008. 1(2): p. 95-101. 10. Friedrichs, N., et al., Phosphatidylinositol-3'-kinase/AKT signaling is essential in synovial sarcoma. Int J Cancer, 2011. 129(7): p. 1564-75. 11. Setsu, N., et al., Prognostic impact of the activation status of the Akt/mTOR pathway in synovial sarcoma. Cancer, 2013. 119(19): p. 3504-13. 12. Jones, K.B., et al., SS18-SSX2 and the mitochondrial apoptosis pathway in mouse and human synovial sarcomas. Oncogene, 2013. 32(18): p. 2365-71, 2375 e1-5. 13. Vlenterie, M., et al., Outcome of chemotherapy in advanced synovial sarcoma patients: Review of 15 clinical trials from the European Organisation for Research and Treatment of Cancer Soft Tissue and Bone Sarcoma Group; setting a new landmark for studies in this entity. Eur J Cancer, 2016. 58: p. 62-72. 14. D'Arcy, P., B.A. Ryan, and B. Brodin, Reactivation of p53 function in synovial sarcoma cells by inhibition of p53-HDM2 interaction. Cancer Lett, 2009. 275(2): p. 285-92. 15. Laporte, A.N., et al., HDAC and Proteasome Inhibitors Synergize to Activate Pro-Apoptotic Factors in Synovial Sarcoma. PLoS One, 2017. 12(1): p. e0169407. 16. Chu, Q.S., et al., A phase II study of SB939, a novel pan-histone deacetylase inhibitor, in patients with translocation-associated recurrent/metastatic sarcomas-NCIC-CTG IND 200dagger. Ann Oncol, 2015. 26(5): p. 973-81. 17. Joseph, C.G., et al., Exomic analysis of myxoid liposarcomas, synovial sarcomas, and osteosarcomas. Genes Chromosomes Cancer, 2014. 53(1): p. 15-24. 18. Vlenterie, M., et al., Next generation sequencing in synovial sarcoma reveals novel gene mutations. Oncotarget, 2015. 6(33): p. 34680-90. 19. Chakiba, C., et al., Response to chemotherapy is not related to chromosome instability in synovial sarcoma. Ann Oncol, 2014. 25(11): p. 2267-71. 20. Lagarde, P., et al., Chromosome instability accounts for reverse metastatic outcomes of pediatric and adult synovial sarcomas. J Clin Oncol, 2013. 31(5): p. 608-15. 21. Przybyl, J., et al., Metastatic potential is determined early in synovial sarcoma development and reflected by tumor molecular features. Int J Biochem Cell Biol, 2014. 53: p. 505-13. 22. Jones, K.B., et al., Of mice and men: opportunities to use genetically engineered mouse models of synovial sarcoma for preclinical cancer therapeutic evaluation. Cancer Control, 2011. 18(3): p. 196-203. Figure 1: Panel sequencing of synovial sarcoma cell line models confirms that most retain intact TP53, although Yamato-SS cells do carry a hotspot inactivating mutation. MDM2 is amplified in HS-SY-II cells, and one allele of CDKN2A is deleted in YaFuss. SYO-1, FUJI and MoJo cells are thus the best models of the p53/MDM2/CDKN2A axis in terms of replicating primary tumor biology at the protein level (Figure 1B). Figure 2: Epigenetic status of CDKN2 in synovial sarcoma. ChIP-Seq results using antibody pulldowns listed on the left, showing residency of epigenetically-modified histones across the CDKN2 promoter region in five primary synovial sarcoma specimens. Figure 3: Most common hits in a phenotypic screen on primary synovial sarcoma cultures. Patient-derived synovial sarcoma cells were exposed to a library of 528 cancer drugs at five different concentrations on 384 well plates, with response quantified relative to normal cells as a control. PI3K inhibitors were the top hits; specific agents are shown in the right hand panel. Figure 4: Example of a patient-derived synovial sarcoma culture to be used by the ICG team. The presence of the oncoprotein SS18-SSX in confirmed by proximity ligation assay (panel 3) as well as by RT-PCR (panel 4). Figure 4. Localized mouse model of synovial sarcomagenesis in the mouse. A: Schematic of a conditional SS18-SSX allele and its recombination products (IRES = internal ribosomal entry site; eGFP = enhanced green fluorescent protein). B: Schematic of localized TATCre injection to induce recombination. C: Kaplan-Meier plots of the non-morbid fraction of hSS2 mice with Pten genotypes of homozygous wildtype, heterozygous, or homozygous-floxed (n = 16, 12, & 35, respectively), injected at age 1 month with TATCre in the hindlimb. D and E: Representative photomicrographs of H&E histology from monophasic and biphasic SS18-SSX-induced synovial sarcomas with Pten disrupted. F: Representative photomicrograph of a biphasic tumor that reached morbidity at age 142 days in a mouse with homozygous Trp53-floxed alleles and homozygous for hSS2, injected at age 1 month. All magnification bars = 25 µm.